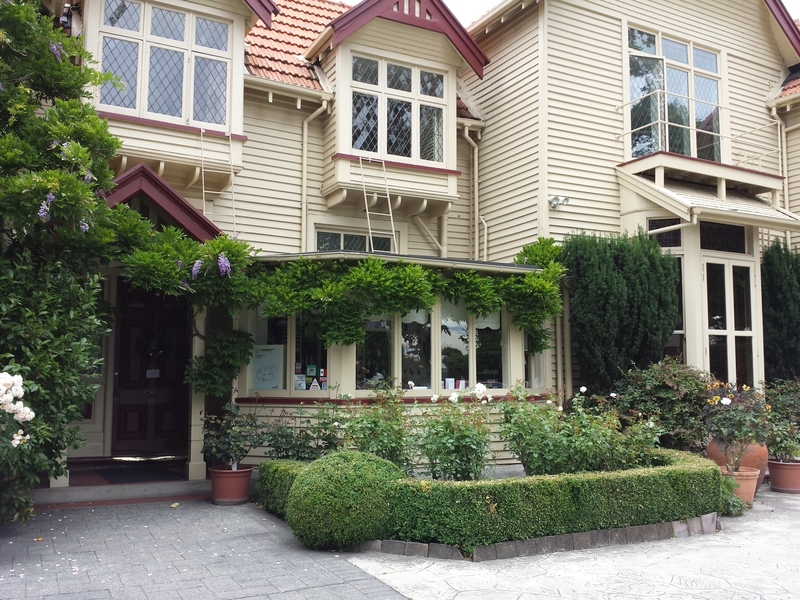 Over the past five years, returning to the city of my birth, Christchurch, New Zealand, was often like returning to school – but the old three R’s rule of reading, writing and ’rithmetic had been replaced with different R’s – I often had to ask if it has been reopened, renovated, relocated or reduced-to-rubble. Unfortunately, with something like 80% of the inner-city, my old stomping ground, demolished because of quake damage, many were reduced to rubble or relocated. Of course many of my favourites have another R as they remained-open or have reopened after minor damage was repaired, while a few had to close temporarily while neighbouring buildings were ‘de-constructed’. A few of my special city-centre places in the remained open (or just closed briefly) category are, The Classic Villa; Canterbury Museum; Botanic Gardens; and The Antigua Boat Sheds. Two months before the September 2010 quakes, a mayoral candidate said if he became mayor he would apply for World Heritage Status for the city’s unique Gothic Revival buildings. 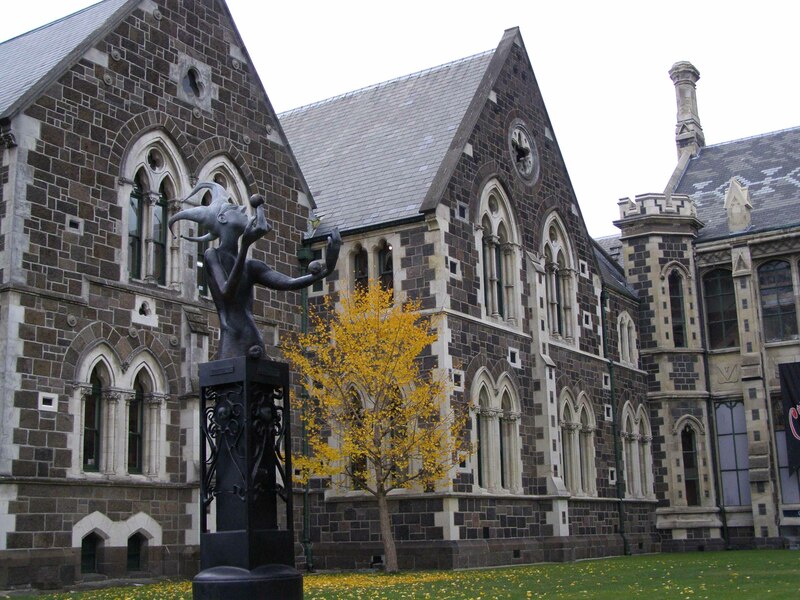 It seemed no city in the world had such a collection of Gothic revival buildings ‘of such high quality and so well preserved’ and I went to the Great Hall in the Gothic style Christchurch Arts Centre, another of my favourite places in the city, to hear about the proposal. He said, “these Victorian buildings date back to the 1850s and as a group are of enormous international significance. They represent the outcome of the furthest migration of any group of people in human history.” He continued, “They are more than bricks and mortar, they are at the heart of our city”. 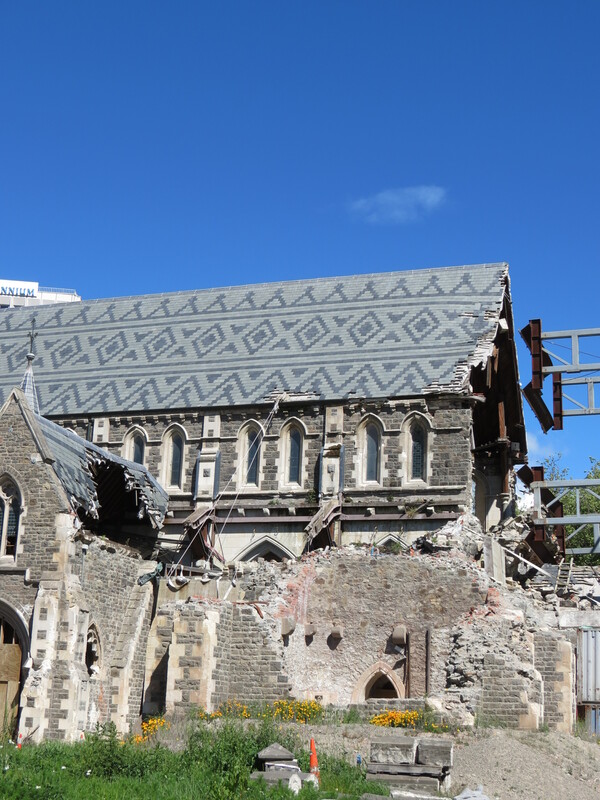 See more I’ve written about our Gothic buildings post-quake. Although the Gothic style is usually associated with churches the mid-Victorian architects used it in other buildings such as Canterbury College in 1873. Other buildings were added and eventually the college became Canterbury University. Over a century later the University moved to a new campus in the suburbs. 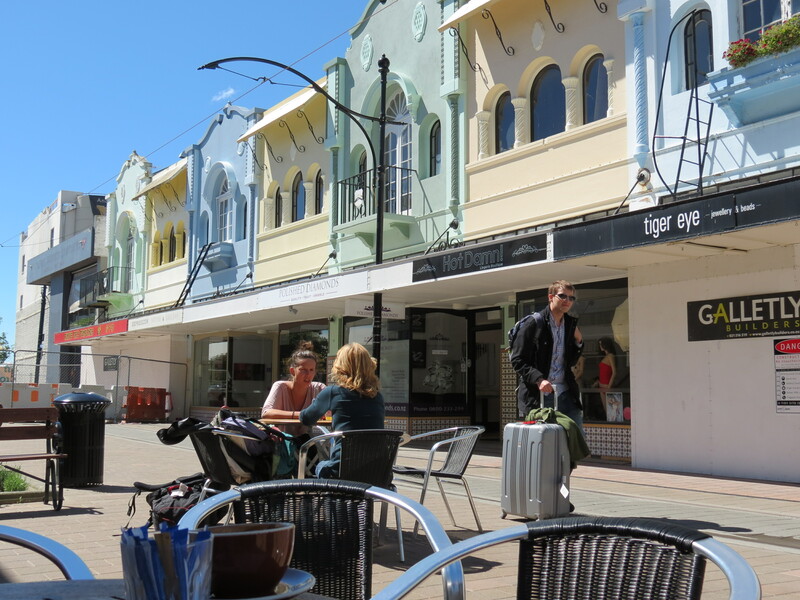 Much of the Arts Centre is reopening this year (2016) and there is anticipation and excitement by retailers who hope to return to the centre and by Cantabrians in general who look forward to being able to enjoy the area again. Check their website to find out the dates various buildings will be opened – and I’m hoping a New Zealand craft market will eventually open there too. The Fool by Sam Mahon is one of my favourite pieces of public art … I wonder where it will move to within the Arts Centre grounds. 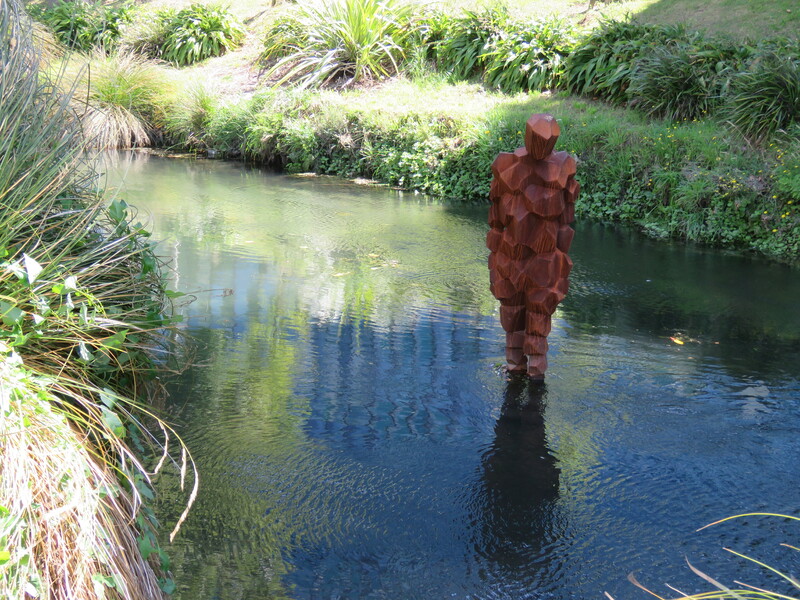 A new sculpture to be installed within the Arts Centre is the twin to this one by Antony Gormley – which is in the Avon (between Worcester and Armagh Street bridges. I believe one of the first places to open this year will be Rutherford’s Den. This Kiwi, Ernest Rutherford, is one of the greatest scientists of the modern age, and he studied at this college from 1890 to 1894: this den is where he conducted some of his earliest experiments and is now a museum and information area. The Den was extremely popular before the quake and now that it has been totally updated I can see even more locals and tourists visiting it. Here are some photos taken during my visit in February 2016 – as you can see there were workman everywhere. Kate Sheppard: suffrage hero or that bloody woman? Christchurch in particular is proud that local woman, Kate Sheppard, was the leader and figurehead of the suffrage movement that resulted in a petition that ensured all New Zealand woman were able to vote from 1893. New Zealand is the first country in the world to give women the vote: married, single, migrant, indigenous, poor, rich, with or without land, working or not – all women were able to vote with the passing of the 1893 Electoral Bill. 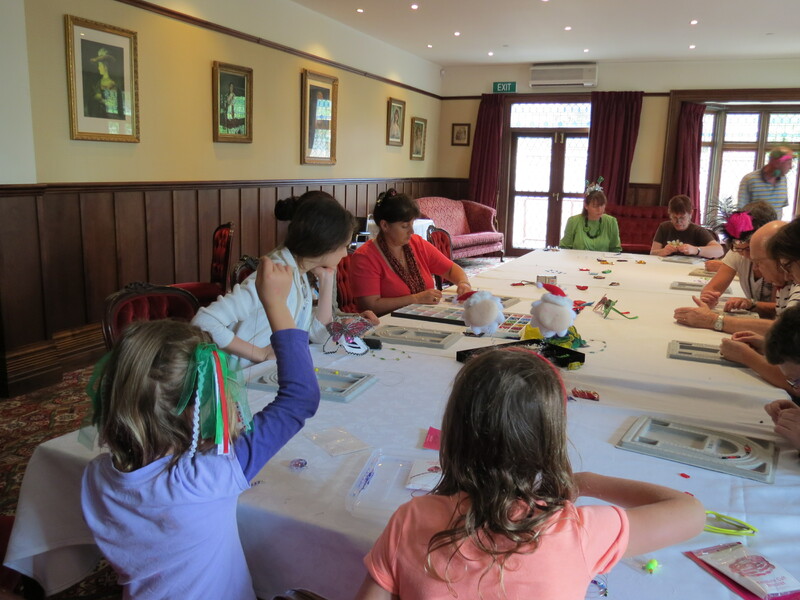 Notice we kiwi did not use the word ‘suffragettes’ as we’d the vote some twenty years before that term was coined! Born to Scottish parents, Kate came to New Zealand in 1868 with her widowed mother, and New Zealand honours her by having her image on our ten-dollar note. Every Suffrage Day, 19th September, a few women gather at the Christchurch memorial panel to pay tribute to all those wonderful women by placing white camellias and purple balloons on this inner city sculpture. Note this is at the corner of Worcester Boulevard & Cambridge Terrace – although with post-quake (2010/11) plans it may be moved. A punk rock musical about her struggles with the Prime Minister (Seddon) has recently been performed at the Christchurch Festival .. called That Bloody Woman, it had good reviews so I look forward to seeing it soon – apparently some were initially ‘shocked at the opening scenes’ when her sexual behaviour was exposed but ‘this quickly abated as the story developed’ I was told. The memorial was unveiled in 1993, the 100th anniversary of this historic event. It has six women on it with Kate Sheppard holding the petition in a wheelbarrow which is how the petition was delivered to the steps of Parliament in Wellington. The side panels show women in typical everyday (1893) settings – gathering shellfish, teaching, factory sewing, farming, caring for families and nursing. These are flanked by bronze panels telling the New Zealand suffrage story. 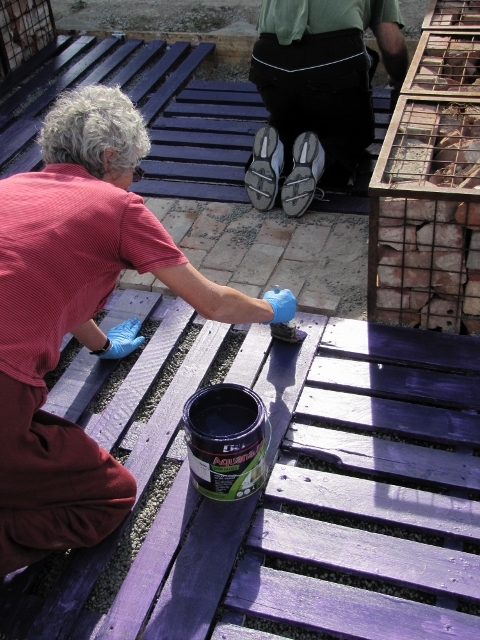 Here are more pictures about one of our favourite kiwi women. Three cheers to ‘that bloody woman’ I say! One of the worlds queens of crime, Dame Ngaio Marsh was born in Christchurch, New Zealand and a while ago I wondered if her house had survived the quake: I’d assumed ‘yes’ given it’s wooden and is in a relatively unscathed part of my old city. The “Ngaio Marsh house” suffered only minor damage during the 2010 /2011 quakes that rocked the city. Sited on the lower Cashmere Hills meant the damage to the area was less than other places the city and Canterbury – a chimney had been demolished and the sewerage pipe was broken but repairs have been made to both. I took these photos during my last visit to the house in May 2010 – my first visit was for a fairly wild party in the early ’80s – not long after her death! Just some of her books .. how many have you read? The world needs more wizards! 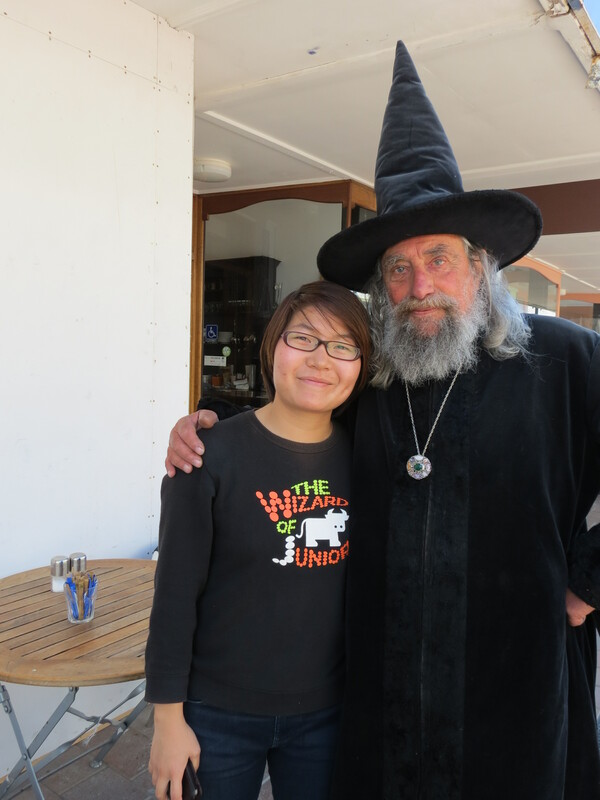 “The world needs more wizards” the Christchurch wizard told me recently. 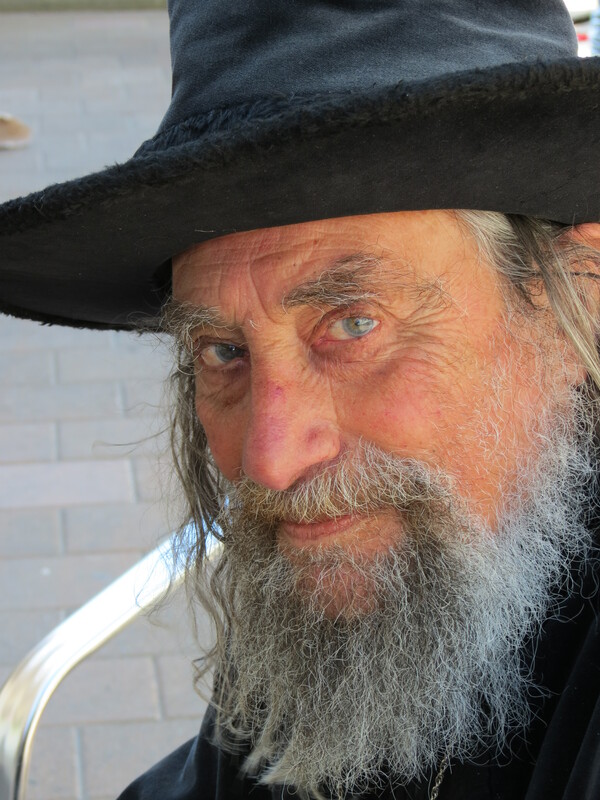 He’s now a daytime resident in the fabulous New Regent Street (city centre – on the tram line too) where recently, over a coffee, hetold me ‘the world needs more wizards’. As someone who does not understand wizardry, as the result of something The Wizard said, I even had to Google the topic of wizards and Lord of the Rings and where I found that “in the fiction of J. R. R. Tolkien, the Wizards of Middle-earth are a group of beings outwardly resembling Men but possessing much greater physical and mental power and that Gandalf appears as a wizard of the order known as the Istari. I knew Harry Potter was a wizard, but that’s the sum total if my knowledge! Not much good to me when I talk with a flesh and blood wizard. New Regent Street survived the quake! The land for the Cathedral was gifted in 1855 by the Provincial Council; building was begun in 1873 and opened in 1881. 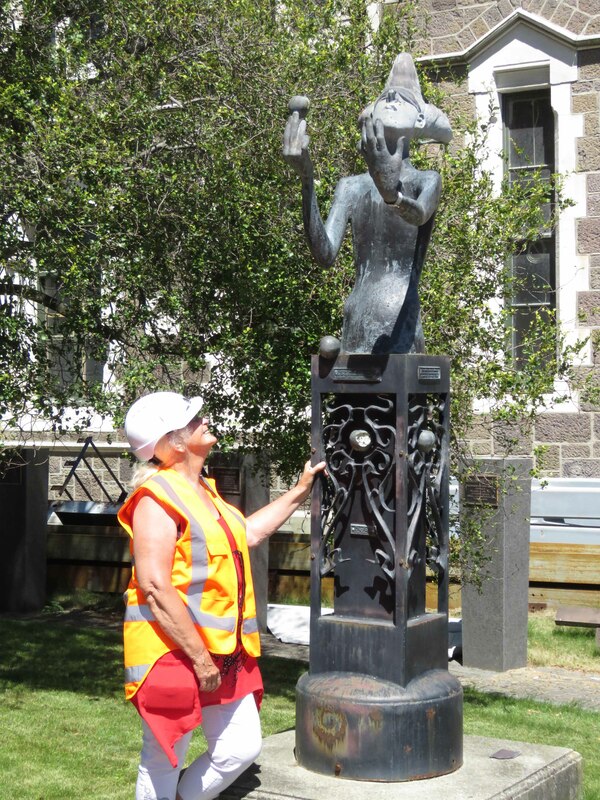 Over the years the council, and the people of Christchurch, (most of who are not Anglicans) have supported the maintenance of the building and I too support the rebuild of this Category 1 Heritage Building. Has it reopened, relocated, been renovated, or reduced-to-rubble? Returning to the city of my birth, Christchurch, New Zealand, is rather like returning to school as three R’s rule. Not the old reading, writing and ’rithmetic but a new set of R’s dominate my thoughts. Searching for favourite places I have to ask if it has been reopened, renovated, relocated or reduced-to–rubble. Unfortunately, with something like 80% of the inner-city, my old stomping ground, demolished because of quake damage, most have been reduced to rubble or relocated. Punting beside the 1880s Queen Anne building, the city’s first council office. Of course there are many of my favourites which have another R – remained-open over the past two years, or have reopened after minor damage was repaired. Some places and activities had to close temporarily while neighbouring buildings were ‘deconstructed’ – for instance punting in the city centre and Victoria Square are now accessible. A few of my special city-centre places in the ‘remained open’ (or closed briefly) category are, The Classic Villa; Canterbury Museum; Botanic Gardens; Coffee House; Tiffany’s; The Antigua Boat Sheds. Check them out! Two places that have been reduced to rubble and relocated are Strawberry Fare, (Bealey Ave) and C1 Café. 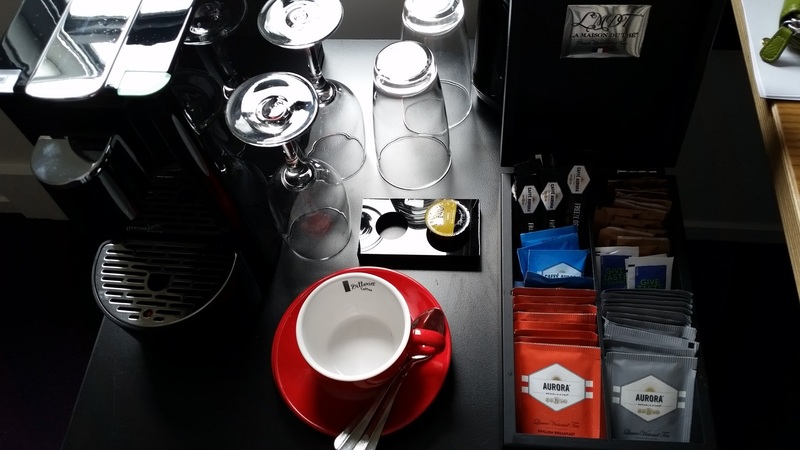 Interestingly, Sam has just moved his café right across from his original High Street spot – into what was my Post Office when I was a child and living in the Central Fire Station. 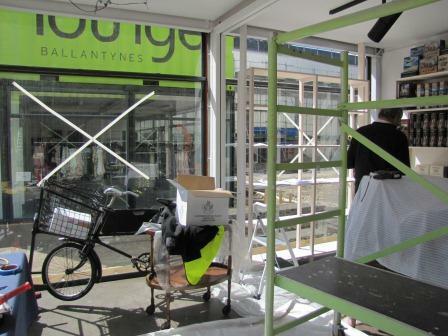 On the corner of High and Tuam, as well as the cafe he now has a roof-top garden (complete with grapes and bees!) with the best views of the city and its rebuild. Get a coffee, go up in the ancient lift, climb the circular stairway then out through the little doorway then spend time up there checking out the changed, and changing, view. This old Post Office, built in 1932 in the Classical style, had in recent years morphed into Alice in Videoland and which is now an art-house theatre too – a valuable asset to the inner city. The Christchurch Art Gallery also has a temporary Art Gallery there, and now The Physics Room (project art space & residency) has return to its home in this building! One of my favourites that are relocated from the city centre is the Dux de Lux – it’s sort of split into two a live music venue in Addington (Dux Live) and a restaurant on Riccarton Road (Dux Dine). 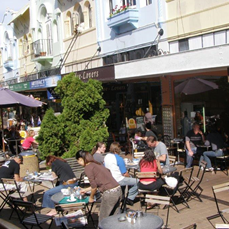 Loved by locals and visitors, ‘the dux’, on the Arts Centre block, was famous for its vegetarian and seafood meals, live music, boutique beers, and casual dining. It was good to go punting through Victoria Square then through part of the ‘red zone’. Yet again it’s sad (Seeing history demolished) while encouraging. (Seeing history being created). Enjoy these glimpses of Christchurch and come back later to see more in the reopened, renovated, relocated or reduced-to–rubble story of this city. Edmonds Rotunda has had the done taken off .. anyone know what’s happening to it? Strawberry Fare has produced great food for years! Every time I return to Christchurch (which I left in November 2010, but not as a quake refugee – the moving decision had been made a few months before the Sept 4th, 7.2 quake) I’m in awe at the many ways people are supporting the re-growth of the South Islands largest city. 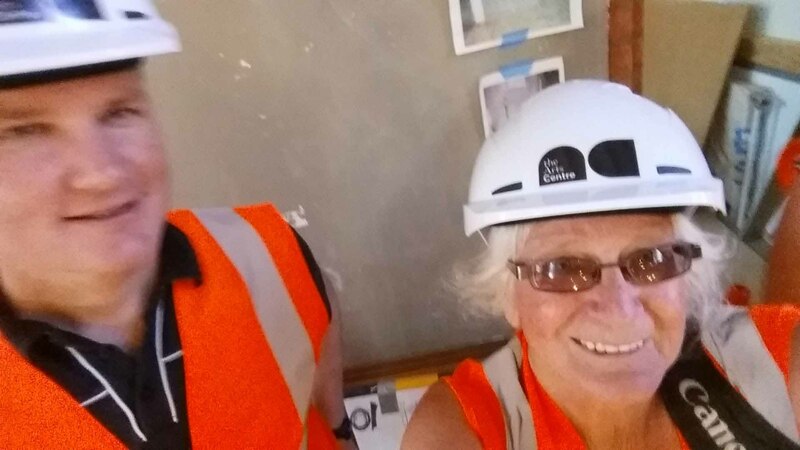 It’s by people like this (heroes to me) that the new Christchurch is being built: brick by brick, plant by plant – my hat comes off to you all! It’s people like this, people like all my forbears, who arrived here between 1860 – 1870 (from Cornwall, Ireland and Scotland) and helped build this city and county. 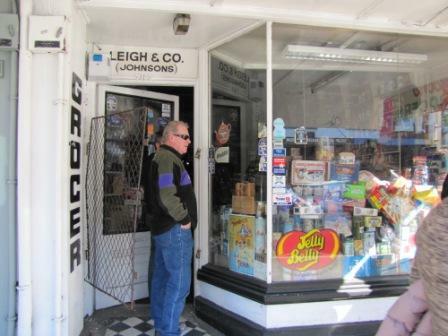 Before the September 2010 quake, just around the corner from my place stood Johnson’s Grocery where locals loved to step back in time: and where I loved to buy freshly cut ham from Colin Johnson in his traditional white apron and delightful manners. 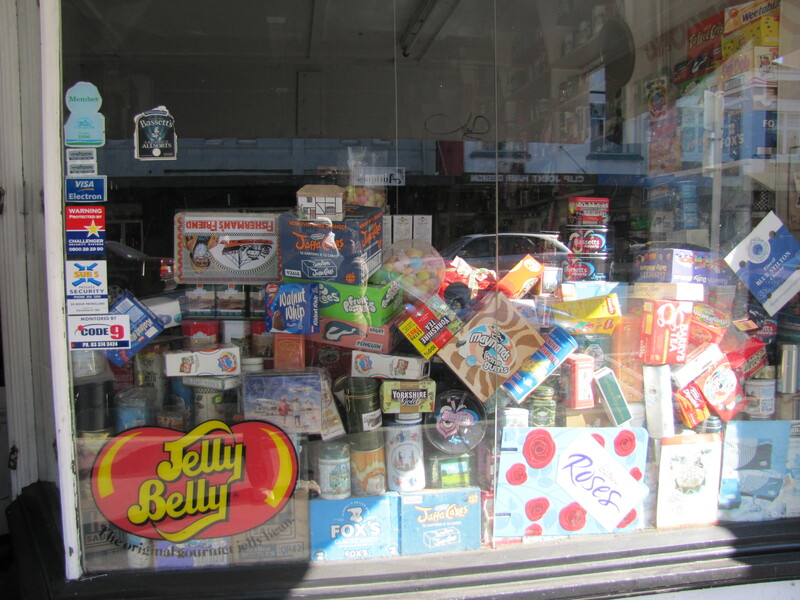 Opened in 1911 as Leigh and Co. it was bought by Colin’s father in 1949 and he has worked there since 1957: this is shopping as it used to be with lollies (sweets) in jars on the counter and cheese sliced from the block with a wire. What I love is how Colin always seems to know exactly where everything is and he climbs up and down a ladder to retrieve whatever it is I’ve asked for. What do you want? Swiss chocolate; truffles from France; English biscuits or cheese; haggis from Scotland, this shop has them all. Colin doesn’t need to search for stock, people from around the world ask him to carry their special goods. 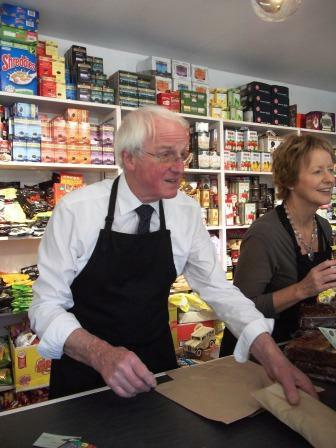 Colin also enjoys welcoming tourists into the shop telling me “They don’t have to buy anything. They are always welcome to take photographs.” It’s certainly photogenic – the old delivery bicycle on the footpath must feature in many photo albums, blogs and travel articles world-wide. Then Christchurch was hit by a 7.1 quake at 4:35am. I clung to the bed in my 3rd floor apartment. I heard a few things fall but stayed in bed – thinking if the building collapsed I’d land on something soft, but also worried about being found in the state of my dress – or rather undress! Vanity rules. Soon up and with warm clothes on, I’d checked out the window and apart from a little concrete block fence that had fallen over, all seemed well in my inner city street despite the aftershocks. I texted this to the National Radio station which was broadcasting reports of this major event in the city of my birth and coffee in hand was also tweeting and posting on Facebook. 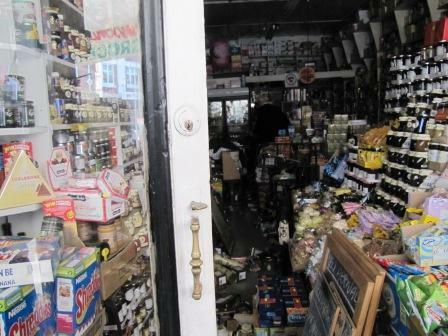 Thirty minutes later I’m going past again – the door is open and a man I hadn’t seen before was standing there. “Do you have permission to be in there’ I challenge him. It seems Colin is inside and he’s his son-in-law. Lots on the floor, but many items still perfectly stacked! Shelves wait to be stocked .. the bike no longer delivers! 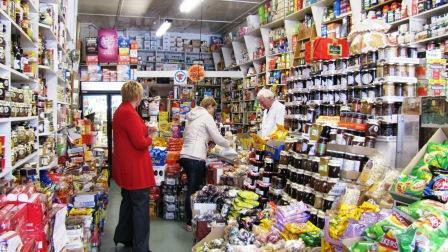 I visited a month later and the shop is buzzing, Colin and his wife are busy and happy, and although the shelves are no longer bowed, they are still stocked with goodies from many parts of the world, so, next time you are in Christchurch make sure this grocery shop is on your must-visit list. 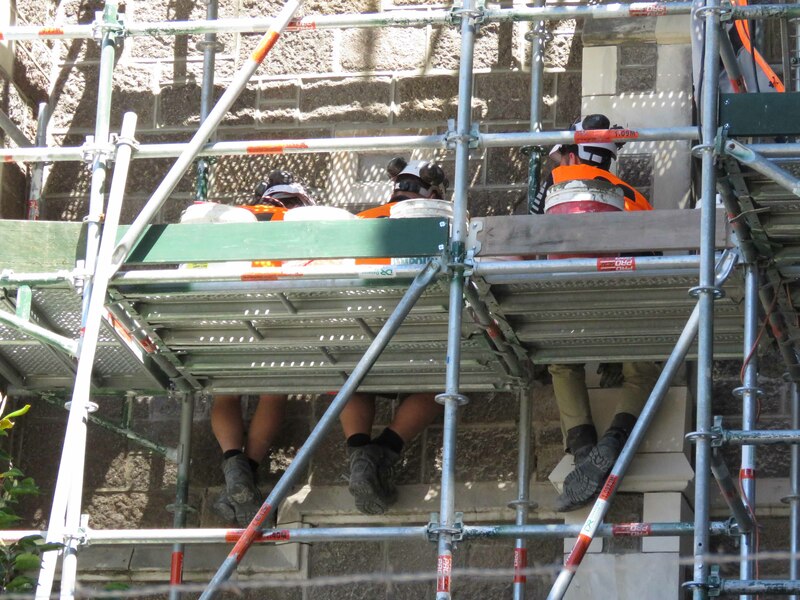 This is the first of my Christchurch earthquake heroes’ award blogs: a shout-out to all business who have re-opened (or stayed open) in my city – sometimes under extremely difficult conditions. 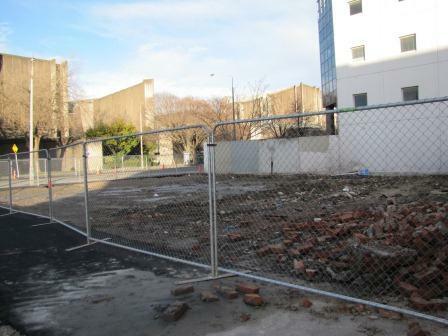 Sept 4th 2010 was the date of the earthquake in Christchurch, so here are photos one year on from my home city. 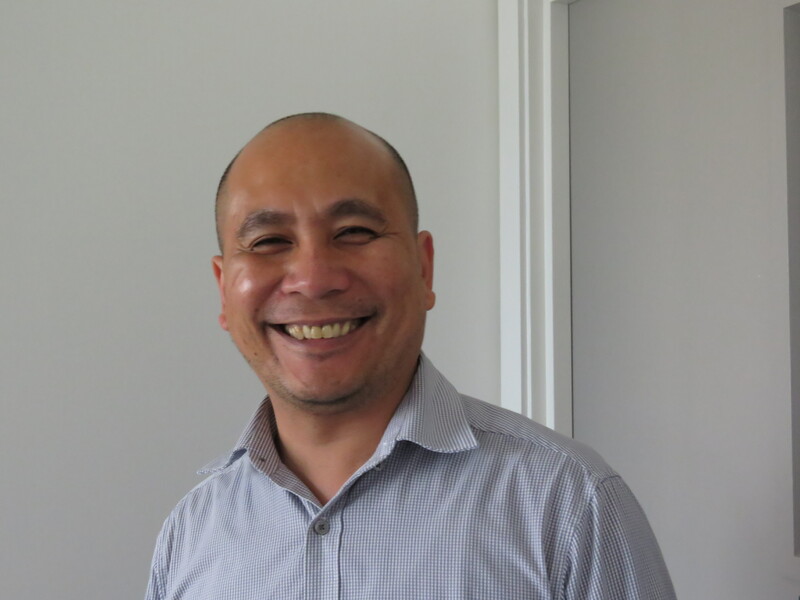 I was one of the lucky ones – I woke to the early morning quake and just held onto my mattress thinking ‘if the building collapses I’ll land on something soft!’ My apartment was 3 stories high and in the inner city – and I was naked. The power didn’t go off: very little fell over, just a few cups, and one framed photo (of me being arrested in 1981 during the disputed Springbok Tour) which had the glass broken. Over 7000 quakes and aftershocks later, that apartment is still fine and still being lived in despite being in the red zone for some time after the Feb 23rd quake – by which time I had moved to Wellington … a decision made some four months before the Sept quake. With the radio on (National Radio NZ of course) and reports of power out, I texted them to say my part of the inner city power was still on, and soon started tweeting. Here are some more photos I’ve taken during July and August 2011 …. 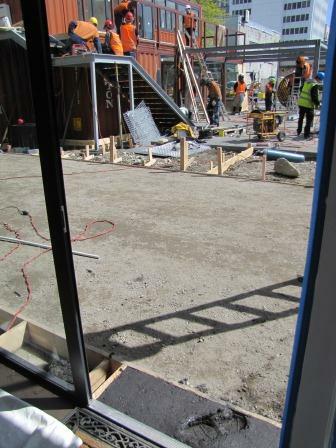 make sure you see my post re Christchurch being open, and see my other quake pics! 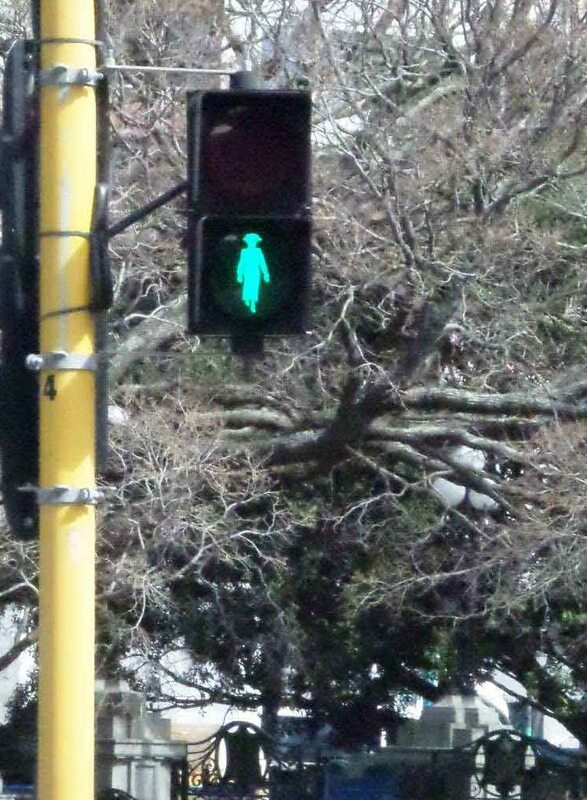 So many signs show Christchurch humour - sometimes black, but funny!